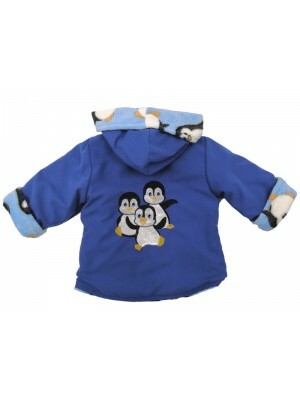 A soft and comfortable jacket with pale blue jersey fabric on one side covered in cute little bumble bees and a plain navy fleece on the reverse. Features popper openings at the front and a roomy hood. 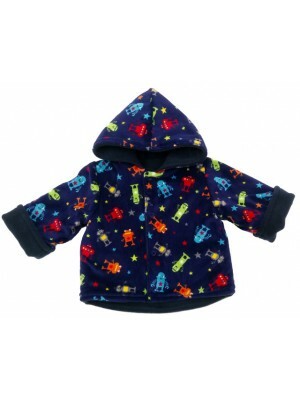 Take a look at the bumble trousers t..
A reversible jacket with a navy fleece on one side and a gorgeous soft and cuddly knitted robot fabric on the other. Popper openings down the front and a lovely roomy hood. Fabric Content – Polyester Fleece / Cotton Elastine Jersey Garment .. 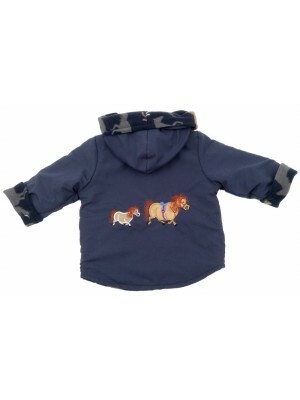 The cutest little jacket with cuddly fleece on one side and a navy soft micro fibre water resistand on the other. A farmyard gathering applique is featured on the back of the navy side. A generous hood and popper openings down the front. .. 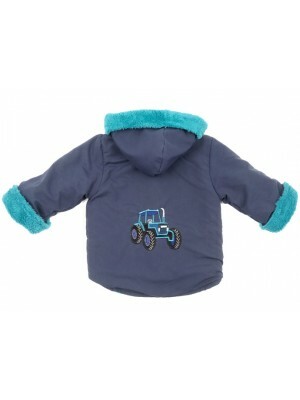 Completely reversible water resistant jacket with a soft navy micro fibre on one side and a teal cuddle fleece on the other featuring a gorgeous tractor applique on the plain side. Popper openings down the front and a lovely roomy hood. Fabr..
A completely reversible cosy winter jacket with a cuddly fleece on one side and a navy jersey fabric on the other featuring a mass of tractors. Popper openings down the front and a lovely roomy hood. Fabric Content – Cotton Elasti..